Today is the Feast Day of the Apostle, St Andrew, brother of St. Peter. 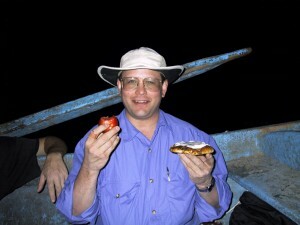 I wrote this in 2000 after a night of fishing with Jewish fishermen on the Sea of Galilee. Since today I am discussing St. Andrew with Drew Mariana of Relevant Radio, thought I would share this story with you again. 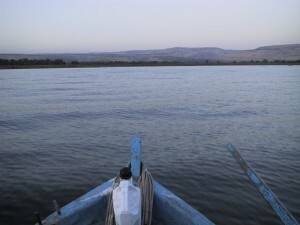 To see my run from Bethsaida along the shores of the Sea of Galilee, click HERE. Join us on a pilgrimage visit my site at www.CatholicConvert.com. I smell of fish and I need a shower, but I’ll get to that in a minute. The moon is still hanging over the the Sea of Galilee and the waves are gently rippling against the dock. The lights of Tiberias are twinkling in the distance and the silhouette of the small fishing boats are visible bobbing in the water. A gaggle of geese are swimming by honking with self-importance while the eastern sky is beginning to lighten. It is about 5:30 AM and I got up at 4:30 to drive around the lake to meet Shemi. Over a cold Maccabees beer yesterday, my friend Shemi asked me to go out with him fishing last night but I was tired with a long day ahead of me today and thought it best to get some sleep, but I promised to go with him later. 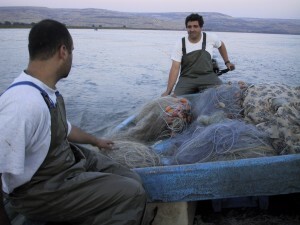 Shemi is a Jewish fisherman (you can see him in my Jesus and Peter DVD’s) who fishes all night out on the Sea of Galilee just like Peter, Andrew, James and John. He reminds me of Peter. 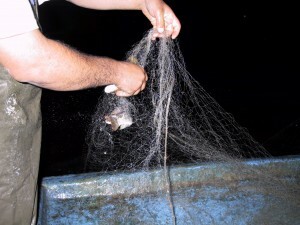 A couple years ago I spent the night out fishing with Shemi and his partner Udi but I got very seasick with the rocking of the boat. My job was to splash in the water and bang on the side of the boat to scare the fish into the net. Shemi asked me to meet him this morning so I could see his catch of fish and how high the water had risen here in En Gev since the last time I was here. It is 11 feet deeper now, a few inches below the full capacity of the sea before they open the dams to let some water out. Yesterday Janet and I spent of day of discovery finding new things and enjoying the familiar. We found the old ruins of Magdala from which Mary Magdalen was named. We got video footage of the site though it is private property and fenced off, even with barbed wire. We found the Springs of the Apostles where Jesus and the apostles certainly rested and slaked their thirst as they traveled through the gorge under Mount Arbel as they traveled back and forth between Capernaum and Nazareth. Several Arab families were there filling jugs of water to take home. Other new sites we discovered were the stone marker commemorating the place Jesus healed the woman with the “issue of blood” and where the synagogue official Jairus requested healing for his 12 year old daughter (Lk 8:40-56) and the Domus Galileaea which is a beautiful new papal institute overlooking the sea which is almost finished. It is used for seminarians to study the Holy Land and for pilgrims to visit. We also had to see how much difference 11 feet of water made at the Church of the Primacy of Peter just south of Capernaum and to say hello to our African priest friend there who said he had finished my book Upon this Rock and enjoyed it very much. Such a thing always makes an author’s day. We ate dinner at our favorite restaurant here and talked for three hours with our friend who is the owner of the Aberge Shulamit Restaurant. She is somewhat of an atheist and very intelligent and thoughtful. She also told us the marvelous love story of how she met her husband in the Israeli Air Force in 1962 when she was only 17 years old. He died a few years ago and a picture I took of him still hangs in the entry of the restaurant. Please pray for her after our very delightful and probing discussion. I hope she takes my challenge to discover the mercy of the God who does exist and who loves her enough to have sent her Jewish Messiah 2000 years ago. 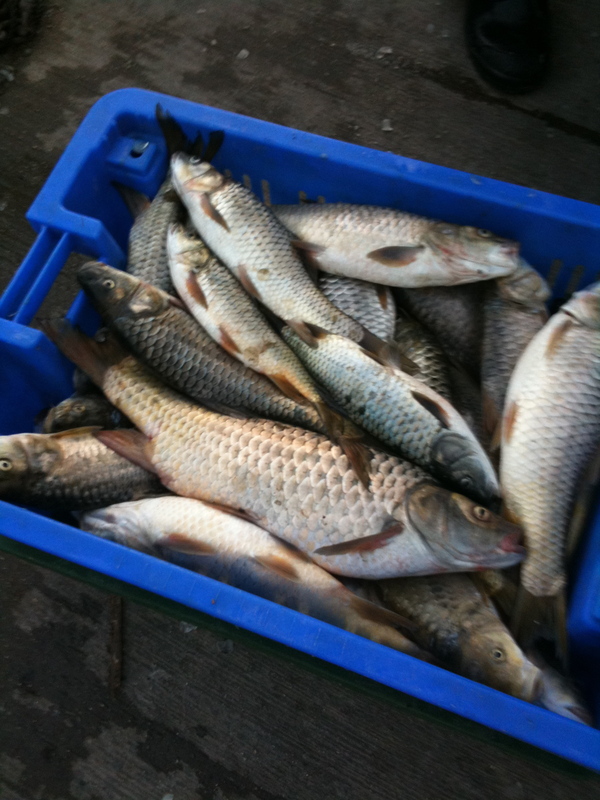 It is now an hour later and after helping Shemi unload, I smell like fish and I’m going to drive back to the Kibbutz for a shower! The danger of scapegoating the Church is that is has given society an excuse not to address the problem in schools, day care, the family and other institutions. Read the article HERE. 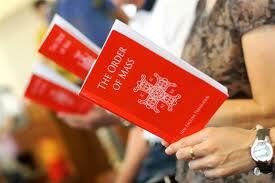 The New Missal – if Frustrated, to Whom Should Your Frustration be Directed? We went to 7 AM Mass on Sunday – not to our usual parish. I could see that some liked the Missal changes and some did not. I sure did, the priest did not. He expected us to follow the new words but he didn’t — he improvised his wording. I know because I followed the new Mass card. The revised wording is elegant, theologically rich, biblically precise and in line with the liturgy of the whole Church. It now accurately translates the original Latin. Why did it need to be revised? The translation rushed through in the 1960’s was an inferior translation. It is as simple as that. The 60’s were marked by a certain progressiveness, a liberal bent, a desire to leave the old Church behind and create a new more modern and approachable Church (which is why many churches built in that era look like Protestant churches). Like Fr. Barron’s wrote, “the translation of the liturgical texts, which was made in some haste in the late ‘60s of the last century, was not sufficiently faithful to the Latin and was, at least in some instances, informed by questionable theological assumptions.” He is being very kind and measured in his comments. If one wants to vent a bit of frustration with change, it should NOT be directed to the good bishops today who have served us well by restoring the much needed elegance and theological precision to the liturgy. The frustration should be directed at those who in past decades did us a disservice with a poor translation that ultimately needed to be corrected. They probably did this because they were influenced by the “loosy-goosey,” hip and progressive mentality of the 60’s.These are the ones that caused the problem. Direct any frustration in that direction. The bishops today have FIXED the problem. They should be praised and thanked, not criticized. If a car is built with defects and breaks down on the freeway it needs to be repaired. Who should you be angry with — the manufacturer who made the mess or the repairman who fixed it for you? I think the ones criticizing are the those people still stuck in the 60’s — like the priest at 7 AM Mass where we attended. I am not angry or frustrated with anyone. I understand the men educated in the 60’s, 70′ and even 80’s were often sold a rotten bill of goods. For that I pity them. Most of these young men entered seminary full of vim and vigor and were let down by the bishops and educators, themselves poisoned by modernism and trendiness. There are still vestiges of it floating around in seminaries and parishes today, but thank God it is dying out. The new bishops and priests understand the gravity of the situation and are making the right moves. The new Missal is one blessed example. Janet and I enjoyed the new Missal, and enjoyed our first Mass using the revised wording. Sure, we stumbled and bumbled through it a bit but that will pass as we learn the new words and they become second nature. The Mass rose to a higher level for us. As the novelty wears off we will be immersed in the beauty of the Mass even more than before. When we celebrate Mass again, this time with a priest who also loves the improved wording, I think we will rise even higher in the pinnacle of worship for Catholics. Who’s Actually Upset with the New Roman Missal? HERE. Top Ten Comments Overheard After the First New Mass HERE. 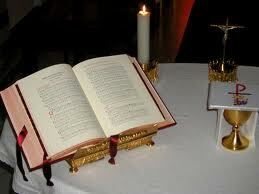 Most Catholics Happy with the New MIssal HERE. Interesting article for those who think the Catholic Church is shrinking in the USA. It is not. Click here for the article and the statistics. Another reason I am thankful on Thanksgiving. Here is an updated picture of Janet and I with our grandchildren. Look what we got started 35 years ago. Blessed be God the Father and Our Lord Jesus Christ forever! Know Someone Who Loves the Bible? – A Christmas Gift Idea! Grandkids Learn the Beatitudes – What Fun! For the full article and more info, click HERE. To see our brochure with itinerary and info on our ship, click HERE.